Dimensions: 17 x 15 in. 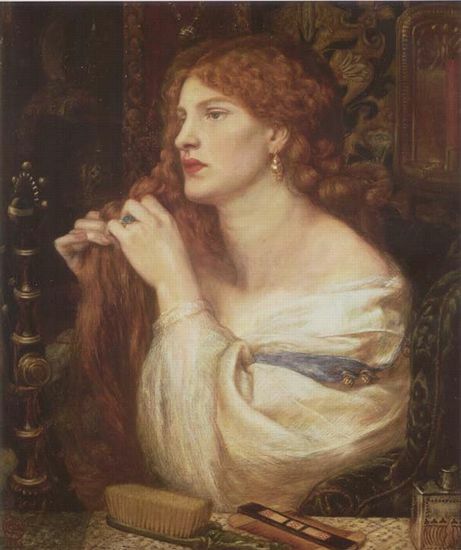 The picture was much reworked in 1873, but the head of the first model (Fanny Cornforth) was not changed. This is an interesting and important picture. More than an act of homage to Titian—though it is importantly that—the painting incorporates, or calls out, three different worlds: Fanny Cornforth, the sitter, is the locus of the picture's modernity; the Titianesque style and the “bricabrac” (as DGR called it) allude to sixteenth-century Venice; and the title makes reference to the world of Dante and thirteenth-century Florence. The presence of the latter was emphasized in the 1863 version of the picture because the frame then was inscribed with part of thecanzone that Fazio degli Uberti had written to his “Mistress,” and that led DGR to title the work as he did. These three perspectives define the three chief points of reference for most of DGR's work as a painter (primitive Italian, Venetian, modern). In this respect the picture functions as a kind of allegory of the trajectory of DGR's artistic career. When he told George Rae, in 1873, to change the title and remove the text by Uberti from the frame, he was essentially arguing that the picture should be seen only as a Venetian-inspired “piece of colour.” The Ubertian text, he came to think, introduced a perspective he wanted to suppress. That act of suppression forecasts DGR's move to establish a dialectic of “soul's beauty” and “body's beauty” for his visionary pursuits between about 1860 and 1875. Both represent poles of a single idealizing process. DGR's move to Titian and Venetian models is a move to explore idealized forms of embodiment, for which the figure of Mary Magdalene was a christological form, a “soul's” form. The image of Fazio's mistress is a “body's” form of the same idealizing state of being. It cannot be too strongly or too often emphasized that pictures like these (or their dialectical counterparts like Beata Beatrix ) are not representational. The female figures are what Blake called “emanations”—exteriorized projections of an experience of imaginative desire. It is entirely characteristic of DGR that he would offer an act of pure stylization—this highly ornamental work, this Venetian “piece of colour”—as an emblem of his imaginative ideal. Venetian art was infamous, particularly in English readings of the history of art, as decorative and without meaning. When DGR deploys the Venetian style as he does in this painting, he is in effect arguing through an act of art-making. More than this, he is arguing that the act of art is in itself meaningful as an idealizing process. By contrast, an art that is representational and anecdotal commits itself, in this way of thinking, to pragmatistic and quotidian meanings—at their highest possibility, to moral meanings. The picture can be usefully compared with Manet's Olympia (1863-1865). The latter's treatment of his Venetian models is boldly ironical. There is no irony at all in DGR's picture. Manet uses Titian to make a statement about beauty in the contemporary world. DGR, by contrast, is not making any statement about the world at all—unless the picture's implicit statement about the function of art can be taken as such. DGR is rather seeking to demonstrate the power of art to make contact with transhistorical orders. The picture is a demonstration of that power. Like virtually all of DGR's art work, it is essentially an act of magic, and perhaps hardly—or only secondarily—a “work of art” in any academic sense. DGR wrote to Ellen Heaton on 25 October 1863 that he was at work on this picture, which he called “chiefly a piece of colour” (see Fredeman, Correspondence, 63. 95). He finished it in November on a commission from William Blackmore but later (in 1873) he took it back to do some alterations for George Rae, who had acquired the picture at that point and “wants some glazing”, as DGR told Fanny Cornforth (see letter of 24 September 1873, (see Fredeman, Correspondence, 73. 289). Marillier says that “in 1873. . .much of the ‘bric-à-brac’ was added” (Marillier, DGR: An Illstrated Memorial , 132), but according to DGR's letter to Rae of August 1869, the picture “was done at a time when I had a mania for buying bricabrac, and used to stick it into my pictures” (quoted in WMR, DGR as Designer and Writer , 69). This has always been one of DGR's most admired works. The comb, brush, and perfume bottle, as well as the ornate mirror, emblemize the worldliness of the lady's beauty. Alastair Grieve calls attention to “similarities” between this picture and Whistler's Symphony in White No. 2: The Little White Girl (1864), but he adds what has always been recognized, that the picture is most in debt to DGR's study of Titian and the Venetian School in general (see The Pre-Raphaelites, Tate 1984, 200). DGR's painting is especially indebted in Titian's Young Woman at Her Toilette , which he would have seen on his trips to Paris, and initially in 1849. A comparison between DGR's painting and Manet's famous Olympia , which was being done about the same time (1863-1865), is highly instructive. Dianne Sachko Macleod has an excellent discussion of the matter along traditional Modernist lines. The picture has much in common with DGR's watercolor of 1864, Woman Combing Her Hair , and of course to the original version of Lady Lilith ; the sitter in both is once again Fanny Cornforth. In its original conception the picture was done as a pendant to Fazio degli Uberti's Canzone (Io miro i crespi e gli biondi capegli) translated by DGR and included in his Early Italian Poets collection. But later, in August 1869, he told George Rae—who owned the picture at that point—that it “ought to be re-named. It was always an absurd misnomer in a hurry, and the thing is much too full of queer details to embody the poem quoted which is a thirteenth century production. Do have the writing on the frame effaced and call it anything else. Aurelia would do very well for the golden hair. I don't think it's bad, but it was done at a time when I had a mania for buying bric-à-brac and used to stick it into my pictures” (letter to George Rae, 21 August 1869, Fredeman, Correspondence, 69. 132). 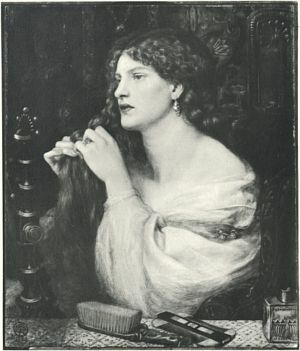 Benedetti, Dante Gabriel Rossetti, 240-241. Bullen, The Pre-Raphaelite Body, 127-130. Gowans and Gray, Masterpieces of Rossetti , 28. Macleod, “DGR and Titian” 1985, 36-39. Marillier, DGR: An Illustrated Memorial , 132. WMR, DGR as Designer and Writer , 68-69. Sharp, DGR: A Record and a Study, 186-187. Surtees, A Catalogue Raisonné, vol. 1, 92-93 (no. 164). Surtees, A Catalogue Raisonné vol. 2, (plate 234). The Age of Rossetti, Burne-Jones, and Watts, Tate 1997, 98-100. The Pre-Raphaelites, Tate 1984, 200. The Studio , Vol. 69, 13. Gowans and Gray, Masterpieces of DGR , 28. Surtees, A Catalogue Raisonné , vol. 2, plate 234.